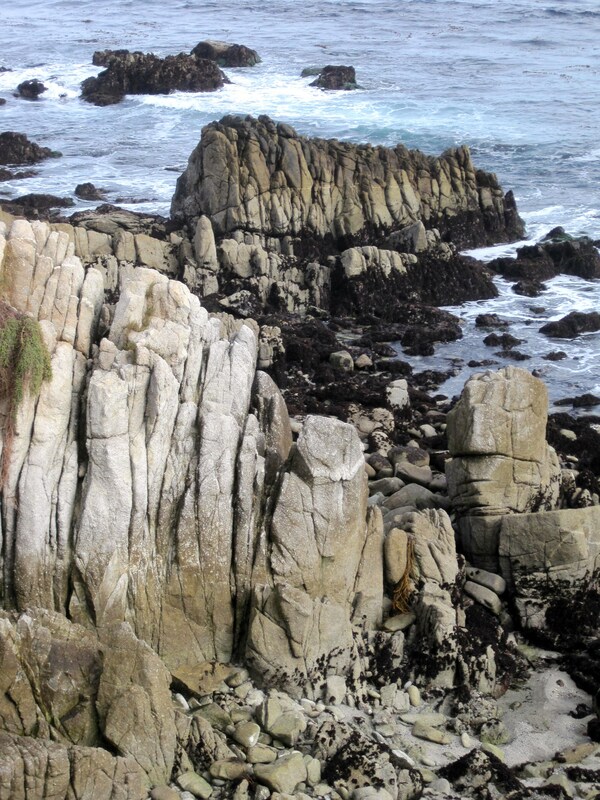 I went out to lover’s point today – in pacific grove by monterey. Today i once again here felt the energies pour through me and this time, unlike the last, did not wander out too far. i felt the joy of the place and a deep sense of gratefulness for all that was there. 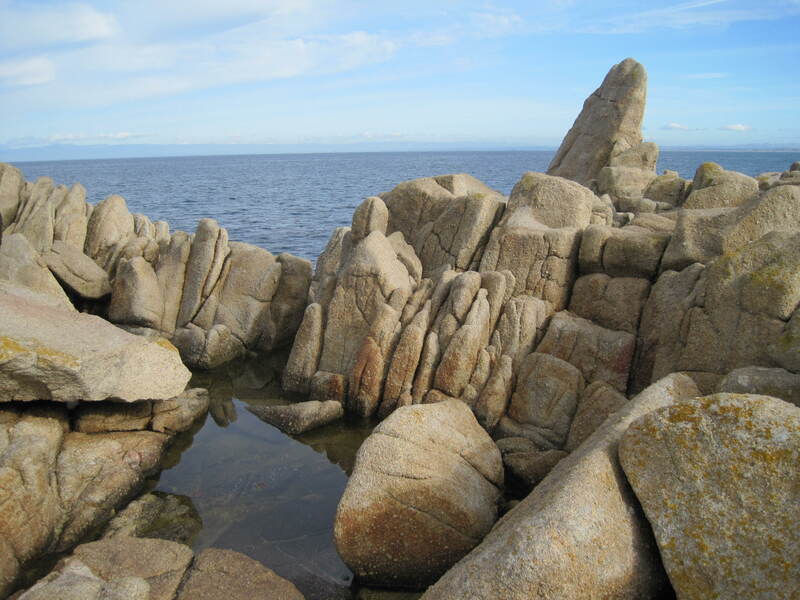 I felt the power of the stones thrust up, a reminder of a time gone by, and could feel the joy of the others who climbed out on this point at low tide. And i was grateful for the day, and the parks and paths that took me here, for all who created them and maintain them to this day. 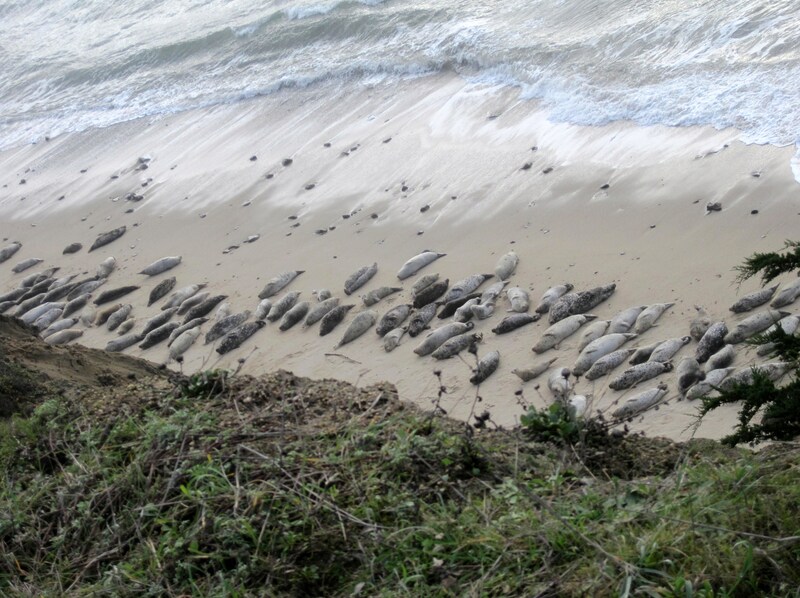 As i walked i looked at the dogs and the wildlife around – the seagulls and mures or cormorants out on the rocks, and as i turned back, the seals who balanced upon them, looking like rocks themselves. I felt at peace and a calm, and a reminder to seek the good inside, to seek out the kernels of light, rather than those of dark. Energies came through intensely out on that point, as they have before, and i realize why it is such a special place and why all continue to make it so. i walked out a bit and then back towards the city and the bay, distracted for a while, until i saw more seals on rocks and the beach, seagulls flying around, a few sea otters with their dense fir, and two cranes by the touristy fisherman’s wharfs. The rocks have power in their uplift, but it is people who help preserve the bay today, and i am thankful for all the forces that have made this a special place. The energies came over me – pulsing through as i came into view of the pillar point air force station – pain in my wrist, my back, a strange headache when near an antenna outside the base but that belonged to it. all was so intense and i was so driven to find out more – but that was now 4 days ago, and i am in another locale and what i experienced now slips away from me. The energy was strong when i first got to the area, and i felt hit all over – at the point montara lighthouse just before christmas, in the aftermath of the eclipse i felt attacked by some strange energetic force – hitting my solar plexus and grabbing onto my tongue. but that had passed and i was now out walking on a sunny day – feeling the calm after the rain and wind storm of christmas day, and the internal storms of the previous week. many were out walking on the sunday after christmas but i felt uneasy in the land – pulses and slippings off and on since i had been by seal cove and sat out by montara lighthouse when i first arrived here. 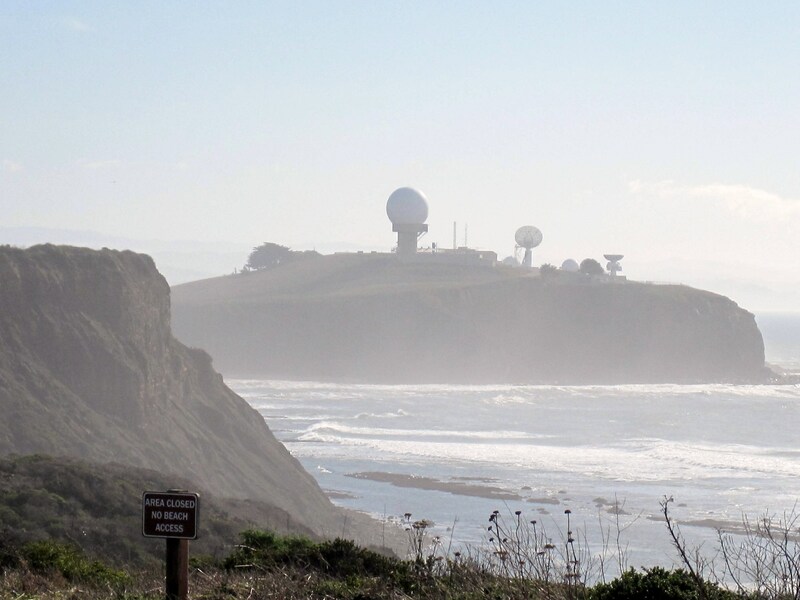 Still i walked back and felt drawn towards that other point, with surreal radar station with antennas and large white balls on the edge of a pennisula marking the north end of half moon bay. and from the map i see that i could follow side streets and a path way all the way there. I walked through moss beach and the main area fitzgerald marine park, looked at the seals down the cliff once again, and followed the path out to the other side, and down more streets, until it started up again, I found ocean avenue which was blocked off, but then saw many people and dogs walking and realized it was now a footpath – at some point it had buckled and cracked and was now closed and overgrown, and i began thinking about earthquakes and faults that dotted the land, at this point i did not yet know, that the san gregorio fault, also known as the seal cove fault, came on land right here in this area, between the park and the point. The second part of the park was up ahead, rolling cliffs on land being restored over the sea. dogs and people passing through. the sun began to give way to grey. walking towards the point i began to feel uneasy – a sign says trail ends here but people and dogs kept going on, and others were coming from there. it was just a sign, saying trail ends, private property, but nothing about no trespassing, and the trail was just as wide as before. Still, i had been feeling pulses in different locales, and something more came on as i neared the end – before the road and parking lot for the marsh lands and the trail out the base of pillar point. a strange headache came up, a searing pain in my right wrist, more that is now a blur, but i felt unbalanced physically, and stumbled a bit on the trail. after i went down to where the cars were and into town it went away. i went by the marsh, and had to cross a polluted stream where dogs swam to get to the beach that connected to the town which was busy on this holiday. interacted with the town a bit and then went back over the bluff – again felt pain in joints, the wrist again, strange pains up and down my back and felt like i had to puke – walked on felt uneasy but then it went away. I sat down on a bench and called on the angels of light to help heal this land and felt calmer then. “The Pillar Point AN/FPQ-6 and AN/MPS-36 radars are highly accurate G-band radars owned by the VAFB’s [Vandenberg Air Force Base] Western Range (WR). 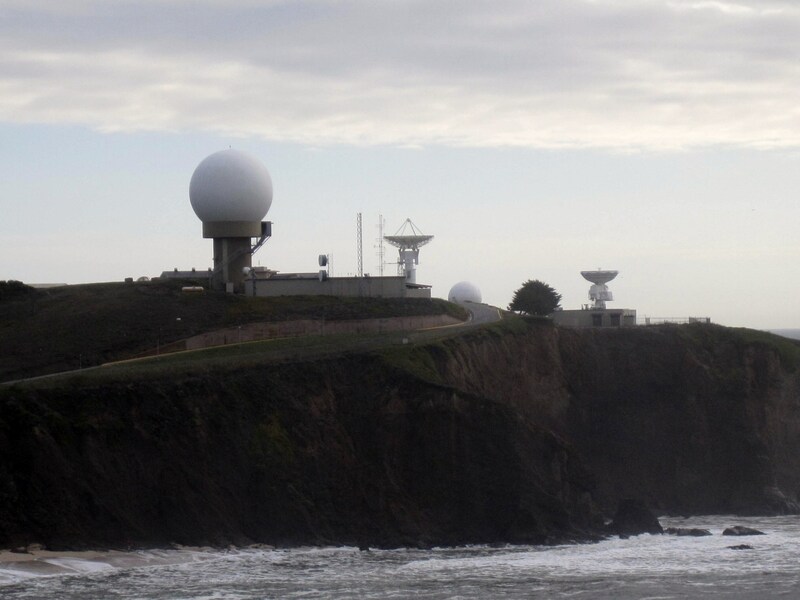 These radars can be used for tracking objects off the coast of central California. Data from the Point Mugu and VAFB metric radars are exchanged over 16 multiplexed channels for TSPI track and sensor positioning. The AN/FPQ-6 is a Missile Precision Instrumentation Radar (MIPIR) class monopulse tracking radar used to provide position data on aircraft, missiles, space boosters, and orbiting bodies. The site can track in either skin mode or in conjunction with vehicle-borne transponders. The radar’s large antenna and high power coherent transmitter make the site’s data quality very high. The sensor can also provide Doppler-derived range rate data on skin or coherent transponder tracks. Non-owners may utilize the services of the radar, but site operations and maintenance is limited to the Western Range contractor. The California Coast has few protective points. Pillar Point is one of them. The Point at night with its string of lights looks like the largest battleship in the American fleet. Source globalsecurity.org. And i learned that Pillar Point is used for telemetry systems -. receiving and recording stations at vandenberg afb and pillar point afs with their associated antennas aquire record and transmit telemetry data to the vandenberg data processing equipment through microwave data transmission systems; metric tracking – radar tracking for range safety and as a command control center. I began to wonder if it was the wavelengths themselves that could be hitting me (the area is closed at night) as i know that when i arrive in a city after being in more isolated areas i can feel blown away by the electromagentic smog for a few days. I also wondered what messages could have been conveyed over those radars those nights – from where and of what quality and intent. Those answers i do not know and may never know … but i can’t help wondering. The light still shown and turned at the short lighthouse as i sat on a bench on a cliff over the sea, and there was a spot as i walked i a direct inland path from the lighthouse towards the building where i slept, that the land just felt a bit less firm. I looked behind at the old bunker behind bench and remembered the land has also once been owned by the airforce. 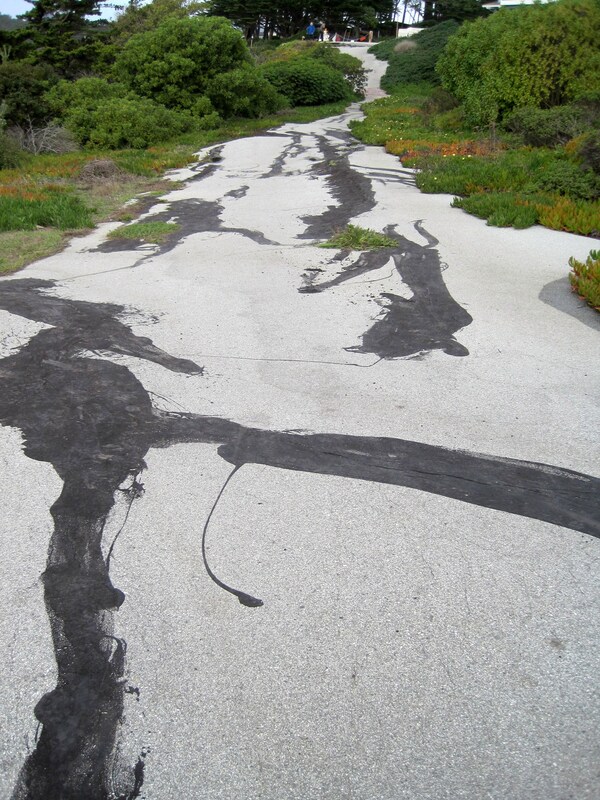 And it was also then that i learned that i was almost on top of an active fault – the seal cove fault – part of the san gregorio fault – and had certainly been when i had been out walking that day – was i picking up on the earths vibrations here? i’m sure i was. and then i had to ask, why was that airforce tracking station located right there – where the fault line goes out to sea? and the main base is also located in an area of numerous faults. Could there be communication from the skies to the center of the earth, or do the faults help with communications? This lighthouse where i stay has once been air force property and was there any link here? were the faults becoming more active? 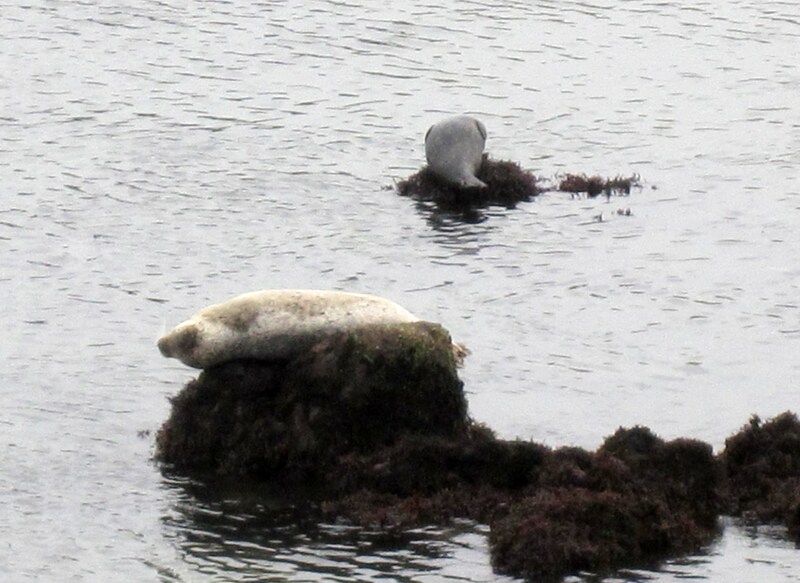 but the next day, when i had to go back again, i saw that the seals and the other animals were calm. i stayed another day – determined to take the walk below the point to see what i felt. I felt some trepidation about this, and seriously wondered if i would be harmed, but i was driven strongly be the need to discover more. something was pushing or pulling me forwards towards the point. as i walked through the park and by the seals i was tempted to turn around, and again on the roadway that has buckled somtime ago, but as i approached the high bluff, i called on god, and the angels of wisdom, love and light to protect me and to help me transmit that energy. The park was emptier that day – and in the beginning felt eerie to me, but i kept on calling on the angels to guide me forth. i walked with awareness of the fault that cut through the land, and of the air force station, and felt the vibrations less intensely. Again i felt land slipping in a few locales and different pulses from the land(but that happens other places for me as well),but the negative thought forms that siezed me before stayed away. below the point i found dogs and people walking along, and wondered if it had all been a dream. i had walked further out towards the ocean that day, and not was close to the antenna, but when i passed under its shadow on the road, i felt my shoulders begin to dance, and waves pulse through once again and energy coming on strong. then i remembered the maps i had looked at the night before, and it occured to me this antenna must be standing precisely on top of the fault. I then went to the town of pillar point and caught a bus to the hostel. i don’t know what the energies were – and as always words fail me, and now i know something came through me, but feel as if my memory has been erased. or is it now that i have moved on, and through different locales, so it is a blur once more, the intensity of all having slipped away. i walked the outside labyrinth at grace cathedral tonight and it affected me in ways it had not before. I truly felt each twist and turn as i slowly made my way towards center. I have come to this labyrinth many times before, and had been here my first night in town – walking in warm winter air. I noted then how a group of teenagers sat about the edge and on the circle on the farthest side, and tried not to focus on how my path was blocked, but told myself i would just simply walk around it, and lo and behold the obstacle, or girl, moved aside for me. Last night was different – i’d had a rough day, one where loneliness welled up inside and i asked myself why i found myself here again – i had tried to go out earlier in the evening, make my way to the park or the beach, but busses and trains were too full to get on, and then after i took a break to eat i was glad, for the rain began to pour down so i crawled back inside in more ways than one – and then finally lifted myself back out and found me walking up there – wondering if i would be able to see the moon. i could it was full in the sky – through a whisp of cloud and then clear. in the quiet park across the street with red lights on the trees, i looked up, wondering when the earths shadow would begin to make its way across, and made my way to the church. it was to be a little while before the eclipse began so i walked the labyrinth of nob hill – up and down the streets look up and at the city below. going out from the center there and returned as the earths shadow was beginning to cover the moon. i came and walked again, asking that all my experiences be brought in and integrated, lessons brought forth, the joys and the pains so that i may transmute them to light. i walked slowly pausing at each twist and turn, and did not mind how long the journey took. i stayed in the center and called forth the light as the shadow grew over the moon covering over 3/4 of it – and then i turned back out into the world once again, shining light on the passageways and beyond. As i was about to emerge, thick clouds came in and blocked out both the shadow and the moon, obscuring the all of the eclipse. So i walked down the hill to where i stay, that messy center at the bottom of the hill. and i realized one of the many lessons that was being presented to me – to remember – just as the earth’s shadow obscures the brightness of the moon, our shadows sometimes obscure our light, but we need to have faith that the light is still there, and will shine bright once more, even if for a moment we cannot see. It was a fairy tale – it was all a fairy tale that i believed in, that i somehow magically wished to be true, to come true; san francisco has been a fairy tale in my mind for so long, and although i was shown that this tale was not true so many times, i wanted to believe, like a little girl i had to believe – it had become so real to me that i could not recognize that it was but an illusion. It was the dream that i craved though i never took the steps to make it real, and it was a dream i could no longer find, and came back to when i blew the others away or when they were blown apart by strong gusts of wind. it is a dream i could not name, but like a little girl reading a fairy tale i believed in it; and after the story faded away, and i was conscious of it no more, it still claimed me though i was not aware. the ideal of Eden, of heaven on earth, the ideal of a place where if you could just make it to, everything would be ok, no not ok, but grand and alive. a place where you would suddenly and magically be able to thrive. And i realize now that i have spent the better part of 10 years searching for this Eden, and the searching and not building up, has left me in a purgatory zone. On one level i knew that such a place did not exist, but on another level, buried deep inside, it was a notion that i clung on to. like the little girl, the teenager of long ago, who would suddenly be allowed to live once she got out of where she was – and san francisco became a place it focused on. it was not only here, but also new york, but that dream was revealed for what it was, an illusion, a long time ago, And even the dream of the place was not really accurate, but a myth i chose to believe, a myth that propelled me forward in my youth and that i returned to when i could vision others no more – the one that held when others, that were more deep, but would require a greater risk, and the possibility of failure, or were said to be too tough, or i just couldn’t believe – were pushed aside. perhaps i am lazy and do not want to work, but i have stripped myself empty coming back here – it is a city, a nice one i admit, but it is not the fairy tale land of my imagination, and probably never was. Perhaps that is why i have been stuck in tourist zone all my times here – for to venture further would be to admit that this magical simple land really does not exist – that it is me, and my own actions that must create magic in a place. and that is it, this, when away, was one of those visions of glory i could hold, a light when all became dark around, the lighthouse that called me forth, and pulled me across the land. But as i wrote last spring, it is an imagined place, and that i have been shown time and time again – and i did not listen, and though i saw, i was blind. For it is inside and out that i must work to create the magic around. i walked down along fisherman’s wharf last night, on my way to visit the sea lions, and very few were there, and looking out at the quiet bay was when this hit me, that i had seen myself as a princess in a fairy tale and this was the magical kingdom that was my home. And it was there by the bay, that the illusions that had clung to me and the warnings i had received hit me over the head with a full force. i was not sad or angry, more reflective than anything, as i saw what had been presented to me so many a time, and asked just why i didn’t really see before – or why i did not remember what had been revealed to me. I had gone down to visit that area one last time, to ride the cable cars once again, before the rain came in. i had wandered that day, to the ocean, a view of the bridge, sang with seagulls, and written about the turrets reflecting castles up on the mount of alamo square where that vision of looking down at a kingdom came to me – right after dull thoughts on how my life has led me to the tenderloin, and how i am no different from those who are cast down and i just pretend. but i pushed that thought away, and later saw the light around. that night i walked down to pier 39, and saw the myths of san francisco again – i cut through union square and then china town – now just stores with cheap goods, which is most likely what it has always been, but I remember back when it seemed so different, before the proliferation of globalization and cheap chinese goods everywhere. we still come back, the banners fly on the street, and tourists smile; i went into city lights bookstore, the place that relives the mythology of the beats and for a moment you can be a hipster writer, and down columbus street, a night with chairs out on the sidewalk under heat lamps, few were around, and i cut through a quiet residential neighbourhood feeling at peace, feeling in fantasy land. And i saw san francisco as truly a place where you can pretend, make-believe you are living grand, and for a while, to visit, it is true. and the joy of those who pass through add to this place. But it is a place to pass through i feel – for it is a city, one that is diverse, grand, overwhelming and expensive, and i ask myself what would i really do here. does the city as it is, in all its complexity truly bring me joy? What does the city life entail? And while coming here recalls my dreams, and the city represents the ability to dream, are they really held in this physical place. Yes i like the climate, even in the fog and the rain, the nature, the hills, the architecture, the transportation and common areas, but what could i contribute here? and how would i survive? and if i stayed, this place would no longer be one to imagine when i desperately needed to recall my dreams – or any dreams or visions. For it is but a place – that is all. and it can be a very hard place as well. And it is a place i loved to explore – but i ask myself after all the times here, am i just retracing worn passageways – is it a passion that can hold? Can i stay and still explore, or are the two contradictory? Do i become jaded and exhausted by all? Is it a problem with stopping anywhere – that i must change my activities as well – and to what and how? and that is a question that eats at me. While the city represents dreams – a place to be me – it is much more in the imagination than in practicality. And it also symbolizes the disillusion with them – as i see what this place is also about – for symbols are contested and diverse – and it is really a place in my mind or heart that i return to, one that does not hold – and the limits of this thought – that i could start living once i found that place – have been long shown for what they are – for life is what happens anyways – and i see the down and out of the tenderloin and others who do not contribute or plant seeds, and i see myself so clearly in them. but is here a place where seeds can really take hold, and plants to grow – and the answer in my heart, or is it my head, says no – and i am still not sure which is speaking to me. have i been telling myself no – or has the place and the universe been telling me so – and to that i wish i had a clear answer – i wait to hear, but i do not. But with the disillusionment – it first came on when i briefly visited in my 20s – one summer trip – and the city was not that of my teenage dreams (and even those were a myth) – and i know once i ended up staying in the mission or soma (before it was called that) when nonprofits still could afford to be in town – back in my radical days – and i felt sad and yearned to move on. And when i came back in 2001 – the day before 9/11 – it is meaningful that i woke up to that here – at the beginning of this journey – and saw the city as a place for the rich, the tourists, and more desperate down and out that i have ever seen, and in the past 3 years i have migrated back here many time – with mixed feelings every time – liking it best when i can staying in my enclosed castle by the bay (fishermans wharf hostel) – and then i am enclosed. but the layers of the story have been written over time, and once here all come into being – the neighbourhoods and life of stability which has become so foreign to me – and like all cities, even with the common areas and diversity – it is a place where people pass by and do not interact – and i feel lonely here – but i do not interact myself – what to hold onto – and is the living vibe really me? but am i called to the center – those faces that haunted me back in 2001, have become more real to me – and does this place also reflect the nightmare that has hung on to me for so long, as well as the dream – and are they two sides of the same story – the fairy tale land and the deep dark forest that threatens around? to be honest, both claim me here – and can san francisco be anything else? should it be? as i write this i realize that it has been the haunting of that nightmare, of ending up alone living on the street, that has driven me and my travels even more than the dream – and that the two are so intertwined, inseparable almost. The belief that if i followed my passions i would end up on the street – but i only partly followed them, and often backed away, and am now kinda homeless anyway. but have i truly come to believe, that one is not possible without the other. is it really fear that has driven me all this time? I think back to waking up here on sept 11, 2001 – and walking down on market street, that day and those that followed, when all the stores and offices were closed – and what i saw were those cast aside, living on cardboard on the street – and it recalled not only one of those intense nighttime dreams that i have had – the ones that take hold of you and whose remnants remain, but also of new york and going there to my dream, not just stepping over sleeping bodies as i made my way to the subway at night or into the first place i lived (which was i all could find, without skills in apartment hunting, huge deposits, or references) but which was sneered at so), and the martha washington hotel – a women’s residential hotel that is no more where i ended up, after moving around and getting caught in an illegal sublet – with both some low paid office workers and students like me, but also the older ladies in odd dress who asked daily for the mail or messages that never came, or the odd screaming from women on other floors, and the rats in the hall at night – but now i also remember being happy there – though i ran back home at the end of the year. was it beliefs that were engrained in my when young, that if i set out, i would fall down bad, homeless – that it was best to play it safe, and not venture forth – and then the worries followed me. and i have been homeless for many years – and all i could hope for here – is a room in a residential hotel once again – and i see all those who beg on the street – not merely those who are so far gone – but the young and middle-aged who find themselves stuck here – penniless – having once sought out their dreams. And as i walk around i am reminded of this nightmare, one that is probably more powerful that the dream – and i ask myself which really drew me back here this time – it was the need to dream again – to throw off the heavy weight that clung to me in Salt Lake – but i also know the nightmare was there – as the winter and the cold came in – and i walked through shelter land on the way to a gallery -not a diverse area like the tenderloin with so many of all kinds about – and asked myself what if i get stuck on the street right here where there is no easy way out and there is real winter? Just truly what was it that drew me here this time. San Francisco has come to represent both the dream and the nightmare so clearly in my mind – and in my heart. This city is so complicated, no longer a simple fairy tale. And i am no longer a little girl – but she is still there – and she wants to believe in fairy tales once again – and occasionally she can – for a short while – until. And i ask myself – have i always believed that i am only able to visit my dreams? I forgot about the rain – how the sky turns to grey and the mist hangs low and calls you within – how the drizzle turns heavy and you get wet quickly – and how the dampness enters into the bones. How it closes in and you crawl inside and explore no more. The rain began today and is supposed to hang on for many more and i ask just what am i doing here. It held off for most of the day, and i was able to explore a bit, but then it turned to a world of umbrellas and i hid out inside – and if i am inside, does it really matter where i am – the expansion of thought and feeling that occurred when i was riding the train, all but disappeared when i went in and sat down. I was thankful that i got out earlier and rode the muni trains around – out to where they are at street level and you can see the neighbourhoods around. Still i got off but once, to walk and explore, in one of the many areas to the south where i had never been – but a chill got into my bones, and i hurried back to where it was dry and warm. Faced turned towards the ground as the rain picked up a steady stream – and yes, this was the other coast i remember all too well – the one that does not inspire my imagination at all. But earlier i took the train down church out to Balboa park – and so many place i would like to take a stroll – the homes in different colours and styles, with so many whimsical motives, and parks to walk, and stores and commercial streets, and trees to Ingleside and more lived in places, neighbourhoods of different types. with the time of year, it is not only the skies that are grey, but they turn dark so early, just before 5pm, shortening the day even more. i was inspired, but i felt blocked, and ended up back in the center of town again. I wished to explore and this place calls me forth, but am i to remain unto myself. the rain is predicted to be even greater over the next week or so. The line snakes around the block – twice – circling, waiting patiently or not. Thankfully, the rain has stopped. The Vietnamese seniors, younger blacks and whites, single men, women – children must be in school – no babes in arms or strollers – many eyes cast down, and most in dark shabby dress. the directors, volunteers in yellow vests, move the crowd along, leave a passage way open on the sidewalk for others to pass through. The wait is long, the crowd is silent in places, and loud and jostling in others – depending on who is in the locale. an argument breaks out, but most are low-key. Other yelling this morning, and i thought the protesters were back across the street, at the Hilton hotel, the last swanky place before the neighbourhood declines and turns to hostels and SROs and other rooming houses inhabited by those on budgets and the poor. I walk outside, for my morning cigarette, pass through the line that crosses the door of where i stay, walk around another block, and pass back through, into a door – but i know that i am really no different that them – of maybe i am, for most have a home of sorts, and an expectation of a holiday dinner coming up. And those who wait for hours it seems, in a sky that threatens rain, wait for that red bag that some now carry along, a christmas food hamper and this is part of the seasons routine. The waiting outside for hours in a line to announce your plight to the world, but at least in the area, the poor and down and out are accepted for who they are, and are still allowed to live here.